Purchasing a wheelchair accessible vehicle (WAV) is a big investment and it can be hard to know where to start. There are many points to consider before parting with your money, and when it comes to buying a WAV, your final decision needs to be informed by everything from size and accessibility to comfort and cost. Finding the right combination of these requirements can be simplified by dividing them into 5 easy to understand specifications. A fundamental requirement of a WAV is its ability to comfortably transport a wheelchair passenger. To obtain the necessary measurements, take the width, length and height of a seated individual and be sure the vehicle has ample room for every passenger. The average wheel span of a chair is around 26 inches, with most WAVs built to accommodate these dimensions. In cases where extra headroom is needed, there are a wide range of vehicles with lowered floors to support this. It is hard to justify purchasing a WAV if the ‘A’ doesn’t stand for accessible. It’s essential that users can enter and exit the vehicle safely, comfortably and efficiently. 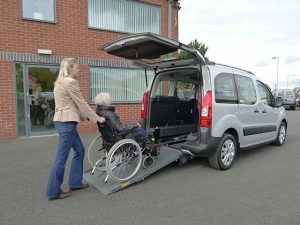 Most WAVs can be accessed via a ramp from the rear doors. These ramps are lightweight and shouldn’t pose a problem when lifting. Side access ramps are very uncommon, however some vehicles do have them. This can create difficulties when the WAV is parked alongside other cars, a problem which can be avoided by rear access. Larger WAV models may include a lift instead of a ramp. Lifts are designed to ameliorate the loading process. However, these can be costly to maintain and can reduce space inside the vehicle. Lifts are a practical solution only if you have heavy or numerous wheelchair passengers using the WAV. The priority position of the wheelchair user inside the vehicle is another important point to consider. In some vehicles, the front passenger seat can be removed to free up space for a docking system, which is ideal if the WAV is only used by two people. In situations where other passengers are present, a middle seating configuration in the rear could be more beneficial. It is common to find WAVs which are equipped with 3-5 seats, though larger models are available. As with all road faring vehicles, the safety of every passenger is paramount. Most WAVs are equipped with restraints that lock the chair in place, both at the front and at the rear. These are almost identical to traditional seat belts and can be adjusted in the same manner. During a test drive, check these restraints are manageable, secure and don’t force you to compromise on comfort. It is always important to consider how far your budget will stretch when purchasing a WAV. Initial costs can be cut by considering a second hand WAV. Be sure to check that the WAV has been checked and tested by a professional team. It’s also worth bearing in mind that the smaller the WAV, the lower the running costs. There’s no sense in opting for a large, high maintenance vehicle if you’re only looking to provide for one wheelchair user, as this will cost you much more in the long-run. Concessions available to users of wheelchair accessible vehicles. Parking is free in many areas for patrons of the Blue Badge Scheme. This includes unlimited on-street parking and the right to remain on double yellow lines for up to 3 hours in England and Wales. Speaking to a specialist WAV dealer can be the best way to talk through any concerns or queries you have, as they will be able to advise you on the best vehicle for your needs. Take the time to weigh up all the options available to you. Making the correct decision first time round can provide you with an efficient vehicle for years to come. At Mobility Nationwide you are welcome to try out any vehicle to ensure it matches your requirements, with free consultation on all models in our range.